St. Justin Popovich: . . . Our era is, above all, an era of idol-worship. . . .
Do you not notice that, in his mania for culture, European man has transformed Europe into an idol-factory? Almost every cultural item has become an idol. Our era is, above all, an era of idol-worship. No other continent is so engulfed by idols as is contemporary Europe. Nowhere else are material things so revered, nowhere else do people live for them as much as in Europe. This is idol-worship of the worst kind, for it is the worship of clay. Tell me, does a man not worship clay when he selfishly loves his earthen flesh of clay, and persistently asserts: I am flesh, and flesh alone? Tell me, does European man not worship clay when he takes as his ideal a class, a nation or mankind as a whole? This entry was posted in Sayings from Saints, Elders, and Fathers, St. Justin Popovich and tagged Idolatry, Modern Age, Modernism, Nationalism, Western on October 5, 2015 by . 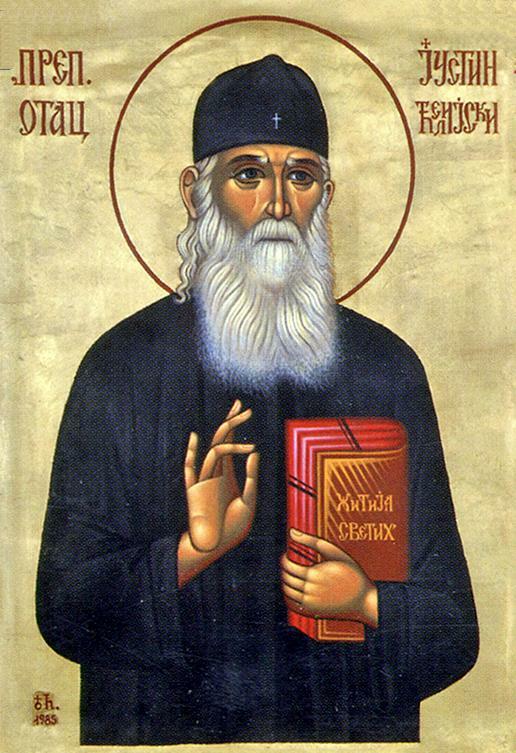 St. Justin Popovic: The third sin, which synthesizes all the sins of the world is: “the pride of life.” . . . The third sin, which synthesizes all the sins of the world is: “the pride of life.” That is the first sin in all the worlds: the sin of Satan. The source of all sins, which always was and will forever stay as such. It can be said: pride is the ultimate sin. Every sin, through its life force, comes from it and holds to it: “the pride of life”–woven from countless multifarious prides, both great and small, both short-term and long term. Let us remember the primary things: the pride of glory (scientific, government, in any rank or position in general), pride of beauty, pride of wealth, pride of benevolence, pride of humility (yes! of humility), pride of charity, pride of success…There is not a virtue that pride cannot convert into a vice. The pride of prayer converts the person praying into a Pharisee, and the ascetic into a self-murderer. So, every sin, in reality is a sin through pride, because Satan in in reality Satan through pride. If it were not for pride, sin would not exist, neither in the angelic or the human world. All this “is not of the Father.” That which is of the Father is the Only Begotten Son of God. He is incarnate and personified humility before all of His divine perfections. In His Gospel, the beginning virtue, the ultimate virtue is humility (Matt. 5:3). Humility is the only medicine for pride and all other sins. This entry was posted in Sayings from Saints, Elders, and Fathers, St. Justin Popovich and tagged Asceticsm, Beauty, Holy Gospel, Humility, Overcoming Sin/Passions, Passions, Pharisee, Pride, Sin, Spiritual Tools, The Evil One, Vice, Virtue, Wealth and Riches on December 27, 2014 by . 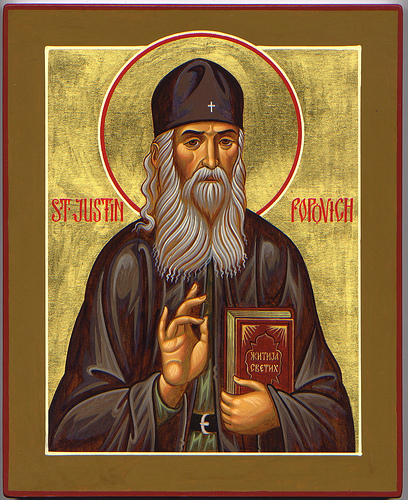 St. Justin Popovich: The principal Tradition, the transcendent Tradition, of the Orthodox Church is the living God-man Christ . . . This entry was posted in Sayings from Saints, Elders, and Fathers, St. Justin Popovich and tagged Apostles, Holy Fathers, Holy Tradition, Opinion, St. Maximos the Confessor, Supremecy of the Pope, The Church on May 25, 2014 by . 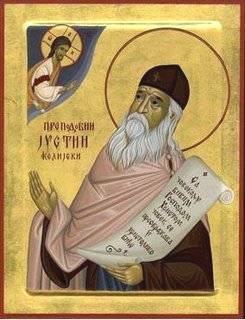 St. Justin Popovich: What is it that the God-man gives to man which no one else is capable of giving? . . .
“What is it that the God-man gives to man which no one else is capable of giving? It is victory over death, over sin, and over the devil, Eternal Life, Eternal Truth, Eternal Justice, Eternal Virtue, Eternal Love, Eternal Joy: the entire fullness of the Godhead and of Divine Perfection. 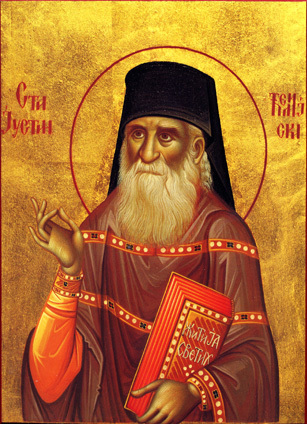 As the Apostle tells us: the God-man gives to men ‘those things which God has prepared for those who love Him, which no eye has seen, which no ear has heard, and which have not entered the heart of man’ (1 Cor. 2:9). This entry was posted in Sayings from Saints, Elders, and Fathers, St. Justin Popovich and tagged Conquering Evil, Forsaking the World, God as Man, Godhead, Harrowing of Hell, Love of God, Material World, The Evil One on March 20, 2014 by . St. Justin Popovich: . . . There is no passion, no sin for which the Lives of the Saints do not show how the passion or sin in question in conquered, mortified, and uprooted. This entry was posted in Sayings from Saints, Elders, and Fathers, St. Justin Popovich and tagged Conquering Evil, Death, Evil, Lives of the Saints, Overcoming Sin/Passions, Passions, Saints, Salvation, Sanctification, Spiritual Death, Spiritual Healing, Theosis, Transforming into a Saint on February 4, 2014 by .